HomePod adds new features and Siri languages<br/>Search by Lyrics, Set Multiple Timers and Make and Receive Phone Calls<br/>HomePod, the innovative wireless speaker from Apple, is adding new features that let customers do even more with Siri on HomePod, including the ability to search by lyrics, set multiple timers, make and receive phone calls and more. <a href="https://www.apple.com/homepod/" target="_blank">HomePod</a> delivers the highest-fidelity audio quality wherever it is placed in the home, and provides unmatched stereo sound with a stereo pair that offers a wider, more immersive soundstage than traditional stereo speakers. HomePod works together with an Apple Music subscription to stream over 50 million songs directly to HomePod. 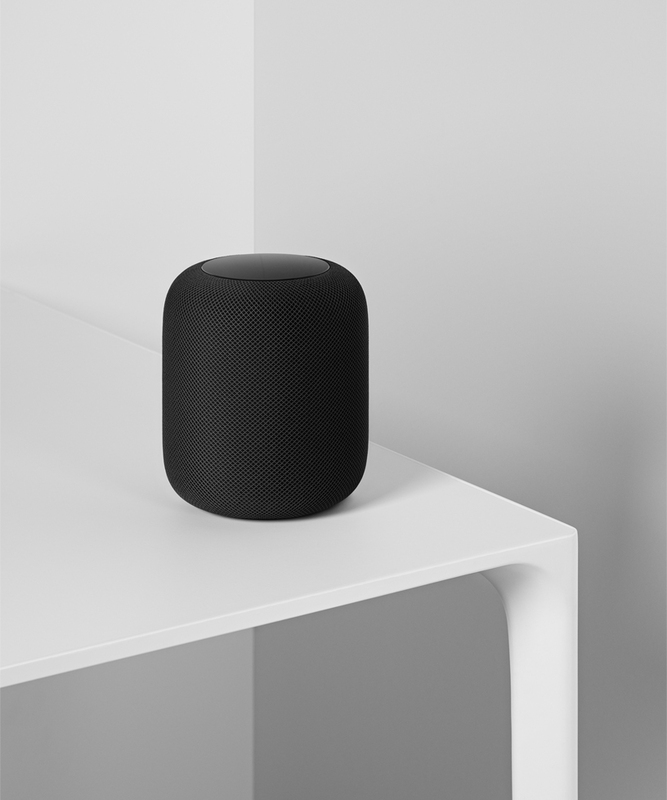 <br/>HomePod combines Apple-engineered audio technology and advanced software to set a new audio quality standard for a small speaker. Featuring an Apple-designed woofer for deep, clean bass, a custom array of seven beamforming tweeters that provide pure high frequency acoustics with incredible directional control and powerful technologies built right in, HomePod is able to preserve the richness and intent of the original recordings. <br/>HomePod delivers an even more immersive listening experience when two HomePod speakers become stereo pairs, delivering high-fidelity sound with a wide soundstage. Using spatial awareness to sense their location in the room, each HomePod automatically adjusts the audio to sound great wherever it is placed and sound great together. And with AirPlay 2, it’s easy to create a wireless multi-room audio system to play music in any room from any room, move music from one room to another or play the same song everywhere using HomePod, an iOS device, Apple TV or by asking Siri. <br/>HomePod is a convenient way to send messages, set timers and reminders, check calendar appointments and the weather, control a wide range of HomeKit smart home accessories and listen to more than 550,000 podcasts from Apple Podcasts. The latest headlines, entertainment news and sports updates stream directly to HomePod, and Univision Noticias, ESPN Deportes, Telemundo Entretenimiento and others are now available with support for Spanish. <br/>Security and privacy are fundamental to the design of Apple hardware, software and services. With HomePod, information will only be sent to Apple servers after “Hey Siri” is recognized locally on the device, via an encrypted and anonymous Siri identifier. « Previous Article Bitcoin.org is 10 Years Old!